London, United Kingdom: The IYF President Krystel SANEH announced today the appointment of Nidhal Lamraoui of Algeria, as Under-Secretary-General. “Nidhal brings a wealth of experience, expertise and dedication to this hugely important role. I am certain she will make an enduring and positive impact on the IYF’s work around the world.” Said Krystel SANEH, IYF President. 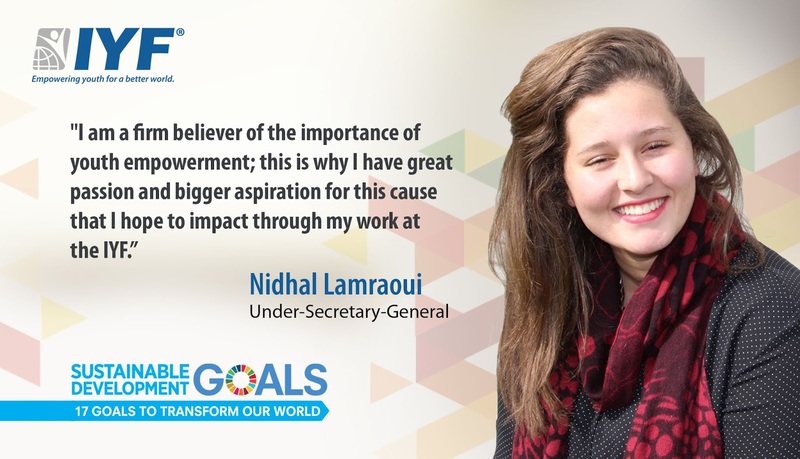 In his comment on the appointment, IYF Secretary-General His Excellency Ambassador Saeed ZAKI said: “We are excited to have Ms. Nidhal in this senior role as she brings with her incredibly strong knowledge and experience which will be vital as we continue our ambitious plans to continue serving young people and contribute to sustainable world through youth empowerment." Ms. Lamraoui brings to this position more than a wide range of experience in civic engagement, advocacy outreach, and coordinating youth and women’s empowerment work, as well as extensive experience supporting strategic management efforts. She previously served as Assistant Secretary-General for Women’s Empowerment, as well as Assistant Secretary-General and Director of the IYF Bureau of Management. Ms. Lamraoui also served as a Member of the IYF Executive Board, IYF Senior Management Team (SMT) and the IYF Oversight and Support Board (OSB). Earlier in her career, she served as spokesperson during ESUMER semana international, where she co-lectured about the development of women's rights in Algeria at University of Columbia, and Co-Founder of HiReF Munich, Co-Founder and Vice President of Arab WIC Algeria and Co-Founder of AlgOlive. Ms. Lamraoui holds a Bachelor in Electronics and Electrical Engineering from Institute of Electrical Engineering, Algeria.